Being overweight is bad for you and your RV. RVs that exceed the capacity work harder, break down faster and experience greater wear and tear than ones that aren’t. Excess pounds also make your rig susceptible to tire blowouts. Even more importantly, overweight RVs raise your legal and financial liability if you’re involved in a wreck. Whether you tow a trailer or a toad, here’s what you need to know about staying within the weight and towing limits of your RV. Is your RV exceeding its towing capacity? Gross combined weight rating (GCWR): This represents the maximum weight of your loaded tow vehicle and your loaded trailer combined. Exceeding these ratings can put you at risk of handling hazards such as trailer sway and tire blowouts. 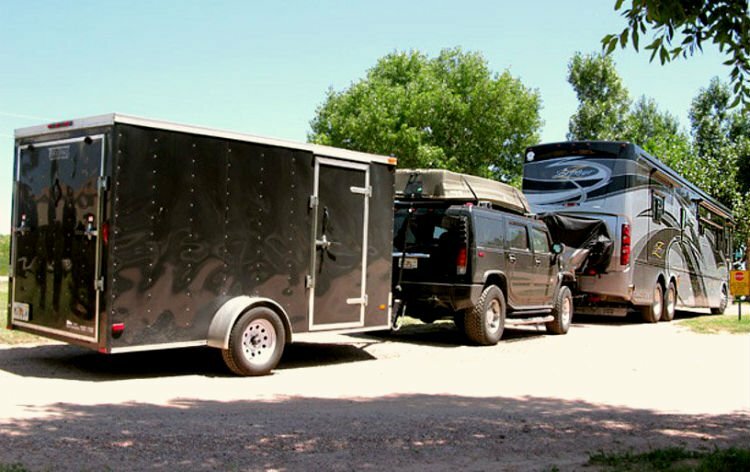 The internet is full of helpful tips to calculate GVWR and GCWR for RVs, but essentially it boils down to subtracting your Gross Combined Weight (or GCW) of your tow vehicle from the Gross Combination Weight Rating or GCWR of your entire rig. Obtaining rough estimates for these figures isn’t hard, but the results won’t give you the accuracy needed to ensure a safe ride. The only only positive way to know if you have an overweight RV is to get weighed at a professional RV weighing station. You’ll find RV weigh stations at many RV events and rallies (just ask other RVers in your favorite RV discussion forums). The weighing process costs less than $75 and only takes about an hour. Just arrive at the weigh station with everything you would have for an ordinary RV trip (including water in your holding tanks, the usual number of passengers, food, gear, etc). 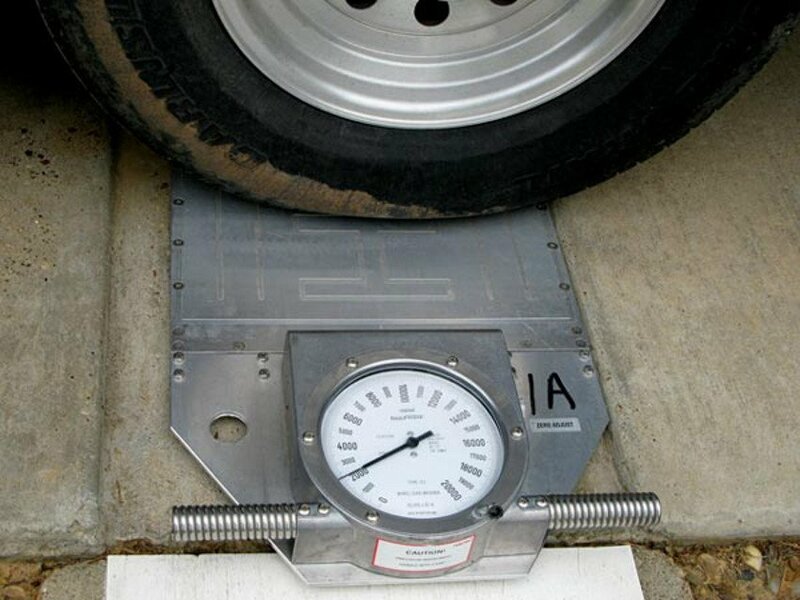 The weigh masters will compare that total weight against your RV’s rated GVWR specifications and the make, model and ratings of your RV and tow vehicle’s tires. Together, it determines if your RV and the tires are carrying a safe payload. Once your RV weigh scale experts determine if and where your RV weight is improperly distributed, you can take steps to alleviate any problems. Sometimes these steps are as easy as moving items around inside the RV and eliminating excess pounds. Other times it’s as expensive as getting a larger tow vehicle or smaller toad. Either way, making these safety adjustments can mean the difference between an uneventful RV trip or being in a terrible accident that makes you wish you had never left home. Hi Sherman. I don’t know of any in that part of the country, sorry. The ones I do know of are through groups like Escapees RV Club (where we had ours weighed). Their Rainbow Parks like Congress and Livingston have year-round weighing so when you fly south for winter be sure to have it done there. Also, if you go to Quartzsite during winter, you’ll find several opportunities through RV clubs and owners groups. Join your RV owners group in the iRV2 Forums and ask, odds are someone will know when and where. Do a search for CAT scales, you’ll find them at many truck stops in Michigan and across the country. I’ve used them to way my rig before. Last I remember, it was about $12 for the first weigh, then $2 to re-weigh. This is important if you have a trailer and want to know your tongue weight, or if you want to move stuff around in the RV. Overall, pretty easy. There are youtube videos that describe the process so you can be confident when you get there. Sherman Dickson, You might look in the city directory for household moving company’s. they usually have scales to weigh big trucks. No idea if they will weigh your rig or not. Maybe they could steer you in the right direction. Great advice Don, thank you. However keep in mind that as far as I understand, truck scales won’t weigh each wheel individually, which is what RV weigh stations do. I agree with you on the wheel weighing, it’s very good to know and to try to balance your load(s). However, I really feel,unless that one wheel/tire is extremely overweight, your axle weights are as important. However, I’m looking at them from a trailer point of view. You can have a many hundred lb difference between your front and rear axles and not see/realize it until that “china bomb” blows and takes out a good sized section of the wheelwell, brake lines etc. Most scale operators, in my experience, if you arrange to be weighed during a slow time, will gladly weigh each axle for you. State road load limits, have both gross and individual axle limits, so the scales are used to doing individual weights. My brother, an long haul driver has been made to shift his load because of a 300 lb overload on one axle. So yes, I feel knowledge of each axle weight is important. I’m not trying to downplay the importance of each wheel weight especially the way the factory’s seem not to try to give us a balanced product, I’m just trying to stress that overloading is dangerous! Get at least a gross weight of your rig ready to roll, but do not pass up the chance to obtain wheel weights! Remember, those tires are all that’s between you and Judgement Day! OK Don I see your point now, thanks for clarifying. Makes total sense. While wheel weights are the final measurement, axle weights are a good first rough estimate that can at least get you close.